Day three of seemingly endless rain and gusty winds - I have two saucepans catching water from a weeping roof, one in the dining room and one in the entryway (I've already tripped over the latter countless times). But I'm content. The wind is softy whistling its way through every lean crack of this old farm house, giving it a cosy, haunting ambiance. There's still a handful of mustard colored leaves clinging to their sinewy branches outside my window, if I look up from just the right angle, the leaves appear to be scorching the dark grey sky. I also have a healthy stock of wild mushroom bisque from the local bakery, another pot of fresh coffee on tap, and about four three spiced muffins to see me through the next 12 waterlogged hours. I love the fact that some of my oldest recipes are still the most popular, unfortunately a lot of those wonderful recipes are attached to horrid food photos. I can't help but cringe whenever I see my overexposed, way-too-close, photos of yore on Pinterest (never mind my addiction to commas and run on sentences!). The streusel muffins with maple glaze almost always pop up on Pinterest once a week. I adored the recipe but loathed the photos - a revisit was long overdo. It's basically the same recipe, slightly buffed and polished. I tossed in a few more spices and changed the oven temperature. Fluffy, soft, punched with spice and dripping with an intense coffee flavour...it's easy to see why everyone falls head over heels for these muffins. Snuggle up with a warm cup of strong, creamy coffee, a pair of muffins, and a beloved book. What more could one ask for on a blustery autumn day? Prepare the streusel: In a medium size bowl, whisk together the flour, brown sugar, allspice, ginger, cinnamon, and salt (make sure any sugar lumps are broken up). Add the bits of cold butter and toss to coat. Use your fingers or a pastry cutter to work the butter into the dry ingredients until the mixture is crumbly - it's okay to have a merry mix of large and small chunks of streusel. Cover and refrigerate while you prepare the muffins. Muffins: Preheat the oven to 375 F. Butter or spray or line 12 molds of a regular sized muffin pan. Set aside. In a large bowl whisk together the flour, sugar, espresso powder, baking powder, cinnamon, nutmeg, and salt. Stir in the brown sugar. In a separate bowl, whisk the coffee, melted butter, egg, and vanilla extract together until well combined. Pour the liquid ingredients over the dry ingredients and, with the whisk or a rubber spatula, gently but quickly stir to blend. Don't worry about being thorough-a few lumps are better than overmixing the batter. Divide the batter evenly among the muffin cups. Remove the streusel from the refrigerator. Sprinkle it over each muffin, then use your fingers to gently press the crumbs into the batter. Bake for about 17-20 minutes or until a knife inserted into the center of the muffins comes out clean. Transfer the pan to a rack and cool for 5 minutes before carefully removing each muffin from it's mold. Cool and remove muffin liners (if using) before adding the glaze. Glaze: In a medium bowl combine the sifted sugar and maple syrup. Mix until smooth. Drizzle over the cooled muffins with a whisk or fork. Your muffins look glorious, just the thing to get one through a rainy deluge. I'd love to curl up with a couple, plus a hot cup of coffee and a good book - bliss! I love this quote, especially since I adore autumn and feed a passion for Norway... Beautiful muffins! So soul-uplifting. goodness, i hope that you're dry and warm now! these muffins look delightful, i'm glad they were around to keep you company! I'm right in the middle of doing the same thing with several old recipes! These muffins have it all going on, they look incredible. I love that you've used coffee and espresso powder. muffins + coffee is the cure for this cold. Stay warm dear. I dread looking at my old pictures too. 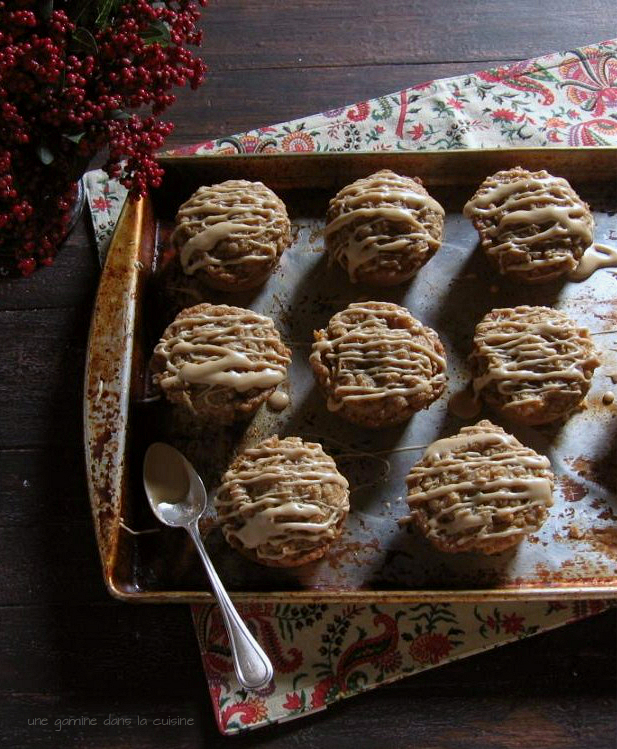 We are having exactly the same type of weather - these muffins look so cozy and perfect. today was our 1st real day of rain here on the cape, and it's just too dark for me. i had to dig out my blue light already to get a jump start on the SAD. Sorry about the leak :( But you at least have these beautiful muffins to hang with!! Yummy looking muffins. Can't wait to give them a try! Sorry to hear about all that rain! I can completely sympathize we've practically had a typhoon here! Muffins make everything better, especially these! Another great recipe! We're totally going to make this recipe tomorrow. So lovely, Valerie! And surely delicious with the falvors of coffee and maple. November is always the dreariest month and perhaps coldest too, rain washes out all the charm of fall, doesn't it? I've been looking forward to catching up on your posts and of course you don't disappoint. You have such a way with words--always a very nice read. I know only too well what you meant about commas and run-on sentences--not on your blog but mine. These coffee muffins are hitting all the right notes with me. When you said coffee muffins, I thought you meant liek coffee cake,,, no there is coffee in it,,, LOVE YOU!